Did you know that January is named for Janus, the Ancient Roman god of transition and the overseer of new beginnings? Represented as a double-faced head (for the future and the past) Janus was often figured on Roman doorways, arches, and entryways. Let’s use this month of new beginnings as an invitation to walk through the doorway past the downsides of our tech-saturated lives — messaging or social media addiction, fake news, hacking, and such — and instead, walk through the portal of inspiring, optimistic future of technology that can power us with positivity and restore our faith in humanity. Last year’s overwhelming abundance of civil strife, war, violence, poverty, racial tension, aging populations, sickness, global political struggles, and beloved celebrity deaths, made it way too easy to become a pessimist. Is it time to give up? Should we all just turn in our keycards and queue up for the people zoo while the machines battle it out to control our lives? Or could it be that we are at the dawn of a new world of humanity, where technology can amplify our human capacity for good? Lost in the headlines are the great technological advances that move our world forward. So, let’s sharpen our focus and consider some of the truly amazing work in science and technology that are positively impacting the human condition — far more than the negativity that captures the headlines. We now have the means — and if we can channel our energy into actions — the motivation to create significant, lasting change across all facets of human existence. Yes, you read that right: through the use of technology, humanity has the means, as never before, to be agents of good. Throughout history, we have viewed technological progress as a negative when it first appears, and then come to realize that it suits us well, is invaluable, as it becomes a way of life. 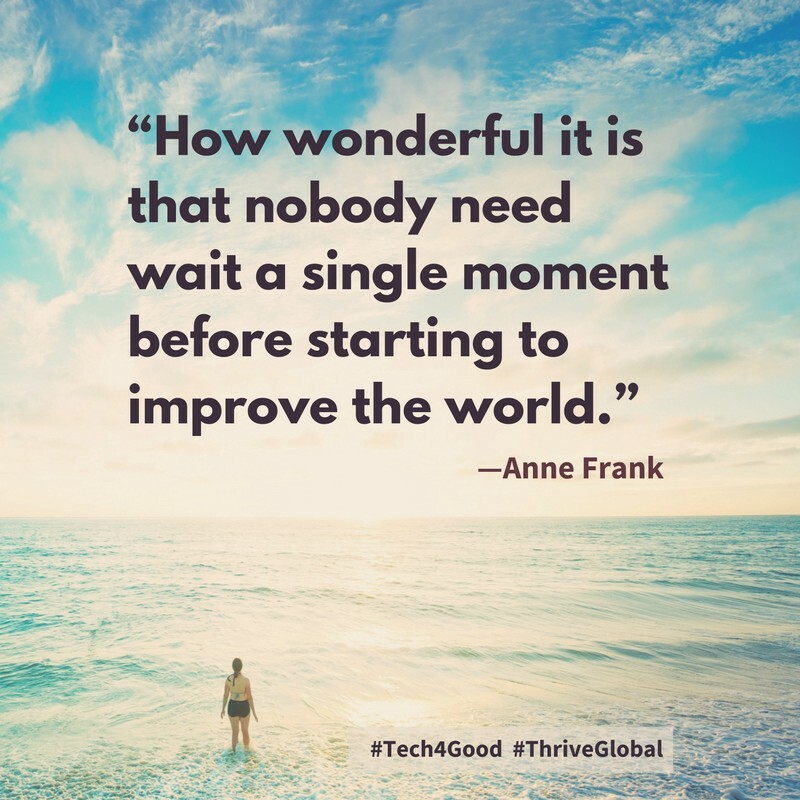 As we enter the new year, let’s put our collective energy into the creation and spread of technology for good in the world. There is no shortage of challenges where we can apply the unprecedented power and capability of technology, and the great hearts and minds behind it. Let’s focus our attention on being part of the solution. When we survey the history of evolution, there are multitudes of examples of animals and humans using “tools” to further their existence. The earliest stone tools are over 3 million years old, and Jane Goodall’s studies of chimpanzees make famous the use of tools by animals — and other animals including birds, elephants, and dolphins have all shown the ability to use tools to help them with food, shelter, defending themselves, grooming, construction and recreation. What we’re offering here are real examples of how technology is changing the world for good and why 2017 could be the greatest year yet for human progress. Our invitation to you is to share your stories of tech for good with us and for us all to reach out to our networks share these stories of the positive influence of technology in the world. What fires you up? What challenge — personal or in your community — are you up against? Where do you need information, help and support? We’re here to help and inform as best we can: we believe in the community of like-minded people to both spark and sustain meaningful change. A leap forward in embryo technology with the pioneering work by Doug Turnbull, allowing doctors to apply for a license to create “three-person babies”, thereby providing, for the first time, hope to mothers carrying mitochondrial disease. Doug Melton has shown how stem cells from patients with type 1 diabetes can be turned into pancreatic beta-cells; many researchers are making “organoids”, three-dimensional stem cell cultures that will allow the design of personal treatment regimes and generate new cells for gene editing and transplantation. Equally exciting is the recent discovery by Juan Carlos Izpisua Belmonte, inspired by his work on newt limb regeneration, that it may even be possible to reverse aging. From the great flood to Pompeii to modern day earthquakes and tsunamis, natural disasters are a part of life on this planet. Noah built an ark, the citizens of Pompeii were not able to leverage tech to help them, but in thousands of natural and human-made disasters since, technology has contributed directly to saving human lives. We are getting very close to having mass production of safe and reliable driverless cars. In addition to the saving of human lives with a significant reduction in death and injuries, the social impact will be significant. Car sharing could scale ownership back by 80%, translating into significant environmental pollution, decreased fossil fuel consumption, and dramatic reductions in time and stress spent commuting. The use of technology in education goes back 5,000 years to the invention of the abacus, all the way through Egyptian cuneiforms, clay tablets, papyrus, and movable type. Modern day education was heavily influenced by the invention of the chalkboard in 1890, filmstrips in the 1920’s, the overhead projector in 1960, PBS and educational programs in the 1970’s, and the introduction of computers in the classroom. The trend continues in 2017. In 2017, we will make great strides in applying virtual or augmented reality technology to education, as well as mobile learning, big data, and predictive analytics. There is a world of extraordinary possibilities that Crispr gene-editing technology has opened and the potential for it to help us defeat a whole range of incurable illnesses. By the end of 2014 some 600 research papers had been published that mentioned CRISPR. The technology had been used to functionally inactivate genes in human cell lines and cells, to study Candida albicans, to modify yeasts used to make biofuels and to genetically modify crop strains. Technology and human rights come together across many dimensions. Whether we talk about privacy, ethics, use of big data and predictive analytics, fake news, the rights of humans in machine-led world, killer drones, or the rights of humans in the human world, the ongoing intersection of humans and technology will continue to be a big part of the discussion in 2017. Coding Rights is a Brazilian-born women-led Think-and-Do tank that aims to advance in the enforcement of Human Rights in the digital world by integrating usages and understandings of technology into policy making processes. The eyeWitness App is aimed at human rights defenders, journalists, and citizens in conflict zones or other troubled regions around the world. The app provides a simple and effective way to capture photos/videos that are verifiable and can be used to investigate and prosecute individuals who commit atrocity crimes. The influence of technology on agriculture and farming dates back to the cradle of humanity, where hunters and gathers realized they could plant seeds and not have to forage for food. In recent centuries, the horse and plow, the tractor, and fertilizer all had tremendous impact on agriculture. As a species, however, we face a crisis ahead — as the global population grows, and the amount of fertile land dedicated to farming continues to shrink, and concern for the environment grows, it is critical to look to technology to help us get more from less. AgriTech — aka AgTech — is the intersection of technology with farmers, supply chains, distributors, processing plants to build a cohesive ecosystem to meet the demands of a growing population. There has been tremendous advances in prosthetics over the last several years. Robotics, artificial intelligence, and an increasing understanding of the human body is enabling medical professionals and technology companies to work together to unlock human potential. Post-traumatic stress disorder is a psychiatric disorder resulting from the witnessing of a life-threatening event. It’s common and most associated with military veterans and natural disaster victims. The increase in technology over the last several years brings new options for these victims. A good place to start is with reading about people and how their lives have been impacted here — otherwise, it’s all too easy to tune out and get overwhelmed. The article also shares ways we can all step up as virtual volunteers. Aid:Tech provides blockchain technology to create a traceable aid solution. There is a lot of focus on using technology to help seniors. Over the last several years, there have been tremendous advances to help the aging. In fact, last week’s Consumer Electronics Show in the U.S. featured several. And many stories of the younger generation helping seniors become more familiar with technology. And, although students and elders living side-by-side isn’t driven by technology, one of the many benefits for the seniors is being taught new skills with technology (email, Skype, social media) that can significantly reduce loneliness and isolation and improves their wellbeing and life expectancy. Benefits for the students are the rewards of sharing their poetry, favorite books and wide-ranging conversations they wouldn’t necessarily have within their own age and interest group. The influence of technology on society continues to evolve. Social media, fake news, restricted feeds, clickbait, and citizen journalism all have a tremendous impact on our daily lives. Here are some thought provoking links. Wearable medical devices have expanded from hearing aids to everything from Fitbit, phone apps, and heartbeat monitors to pain management and internet- connected scales. 2017 offers us an opportunity to watch the increasing influence of technology on our health. We will see an increase in implants connected to the net, improved accuracy and mainstreaming of the “quantified self” movement. Consider this our jumping off point and our invitation to you to satisfy your own curiousity. We’ve intentionally come up with a mix of local and global, online and offline activities both big and small to spark your interest. We are all living in a time of unprecedented access to information, communities and initiatives — it’s up to each of us to decide how we use the tech that surrounds us. Here’s to lighting up our lives and our communities with tech for good.